Yet another in an apparently infinite supply of English police procedural mystery series. 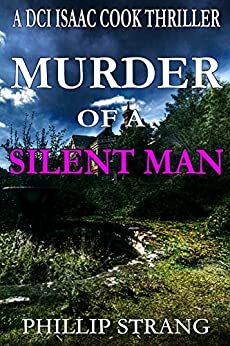 I tried Murder of a Silent Man (I suppose I identified with the title) by Phillip Strang. It had certain virtues which I won’t deny, but overall I wasn’t much impressed. Gilbert Lawrence is the murder victim in this story. He’s an old, reclusive man who only went out once a week, to the liquor store. No one would have guessed he was one of the richest men in the country, unless they noticed the large house where he lived, holed up in a small locked area. But someone took the trouble to stab him to death in his front garden, and now DCI Isaac Cook and his team must unravel the mystery. It’s compounded by the discovery of a human skeleton in an upstairs bed. There’s no lack of suspects. Lawrence had two estranged children, one a prosperous wife, the other a drug addict and con man. For years his affairs have been handled by his solicitor and his daughter, who have been profiting well from his business interests – perhaps too well. The great virtue of this book was its realism. It followed police procedure in a believable way. No flashes of genius insight here, no car chases or terrorist situations. Just solid police work leading finally to a solid – and undramatic – conclusion. I don’t mind that at all. Some people might want more bells and whistles, but I liked this approach. What I didn’t care for was the presentation of the story. The prose was sometimes weak. The characters weren’t very vivid – the suspects were more interesting than the cops, but they weren’t all that fascinating either. We weren’t even given descriptions of most of the cops – except for DCI Cook, who is Jamaican by heritage. Apparently author Strang assumed the reader would have read the earlier books in the series and would remember earlier descriptions. So all in all, I wasn’t greatly impressed. I did appreciate the realism, though.